Three years ago, Nelson Peltz’s Trian Fund Management took a US$2.5 billion position in General Electric Co., insisting it was undervalued and “under-appreciated.” Today, the activist firm’s loss on that investment could be approaching US$700 million. Trian bought most of the stake -- its biggest at the time -- when the price averaged between US$22 and US$24. But the industrial titan’s earnings wilted last year and accounting questions surfaced, dragging its stock price down to less than US$9 now. Trian sold about a third of its original 90 million shares at US$30 in 2015 and only 10,000 since the fourth quarter of 2016, according to data compiled by Bloomberg. 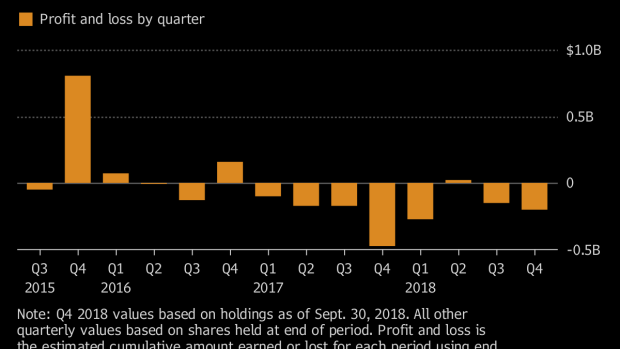 It now owns about 0.8 per cent of GE, close to its original stake because of stock buybacks. The firm’s losses could range between US$600 million and US$700 million depending on the actual execution prices and dates of Trian’s transactions, information that is not available in public filings. Dividends are attributed to the total shares held at the end of each quarter. Trian declined to comment through a spokeswoman. Trian’s stake was initially seen as a vote of confidence in then-chief executive officer Jeffrey Immelt. But the firm increased pressure on him for an overhaul as GE’s fortunes deteriorated. He stepped down in June 2017, replaced by John Flannery, who was ousted in October after just 14 months. Larry Culp then was named CEO and chairman. Ed Garden, Trian’s co-founder and chief investment officer, remains on GE’s board. Trian has been known to hold investments for a relatively long time -- often as many as five to seven years when it has a board seat.